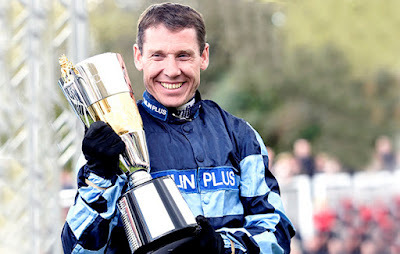 If and when Richard Johnson lines up for the 2019 Grand National, aboard Rock The Kasbah, trained by Philip Hobbs, he will break the record – which he already holds jointly, with Sir Anthony McCoy – for the total number of rides in the celebrated steeplechase. However, Champion Jockey-elect Johnson will, no doubt, be hoping to bring to an end his unenviable record of 20 rides without success. Johnson, 41, made his first attempt in the Monday National – so-called after it was postponed by 48 hours following a coded IRA bomb threat – in 1997 but was unseated by his mount, Celtic Abbey, at The Chair, towards the end of the first circuit. Indeed, it was another five years, and another five rides, before Johnson completed the National Course. However, when he did, he looked briefly as if he might end his Grand National ‘hoodoo’ before it was even worthy of the name. In 2002, Johnson led over the final fence on the well-fancied What’s Up Boys, trained by Philip Hobbs, and was 3 lengths clear at the Elbow. Yet, he was run down by Bindaree, to whom he was conceding 16lb, in the last 75 yards and finished second, beaten 1¾ lengths. Johnson completed the National Course again in 2003, finishing tenth of 14 finishers on Behrajan, trained by Henry Daly, but failed to do so for another six years. In 2010, he completed the National Course for just the third time ever, but his remote ninth of 14 finishers on Tricky Trickster provided little, or no, consolation in the race won – at the fifteenth time of asking – by his arch-rival Sir Anthony McCoy on Don’t Push It. Johnson pulled up at The Chair on Quinz in 2011 but completed the National Course for the next three years running. He once again finished out with the proverbial washing on Planet Of Sound in 2012 and Balthazar King in 2013, but returned to partner the latter into second place, beaten 5 lengths, behind Pineau De Re in 2014. Balthazar King was consequently well fancied for the 2015 Grand National but fell heavily at the Canal on the first circuit. Johnson was again out of luck in 2016, pulling up Kruzhlinin at the third-last fence and, after riding in the Grand National for 20 consecutive years without success, did not have a ride in the race in 2017 or 2018. Few would deny that Johnson deserves to win a Grand National, but his overall record at Aintree – two second places and 14 non-completions from 20 rides – hardly inspires confidence. However, Johnson is on the record as saying that if he does take a ride in the Grand National he wants to do it on a horse with a ‘good chance’ so, maybe, just maybe, Rock The Kasbah can provide the ‘jewel in the crown’ of his glittering career.